How did a company secretary with a car, a small farmer with a tractor, a nurse who deposits his savings in a post office, and an engineer with a public provident fund (PPF) account help the government cut fiscal deficit and provide funds to borrow for extra expenditure? By buying fuel or investing in small savings. Almost everyone, from a CS with a car to a farmer with a tractor, uses fuel — petrol or diesel — directly or indirectly. By doing so, they provided additional revenue of nearly Rs 2 trillion every year to the government. This was instrumental in reducing fiscal deficit, the difference between spending and revenue, from 4.5 per cent of gross domestic product (GDP) in 2013-14 to 3.4 per cent of GDP in 2018-19 (FY19). Also, those who save small amounts of money in post offices or national savings certificates provide an easy, albeit costly, source of loans to the government. This reduces its requirement to borrow money from the open market. 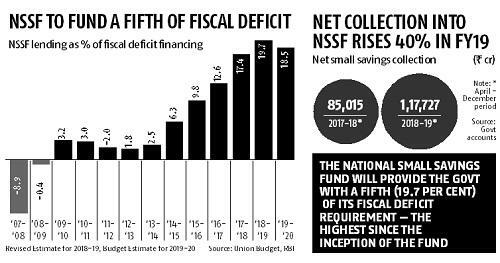 This year, the National Small Savings Fund (NSSF), an aggregation of numerous small savings schemes, will provide the government with a fifth (19.7 per cent) of its fiscal deficit requirement — the highest since the inception of the fund. In FY19 (April to November), deposits in the NSSF have increased 40 per cent to Rs 2.1 trillion from Rs 1.5 trillion in FY18, according to official data. Since 2016-17, the NSSF’s share in fiscal deficit financing has been above 10 per cent. For 2019-20 or FY20 also, its contribution will be 18.5 per cent, according to the interim Budget. This would, however, have mixed results, according to experts. One on hand, it would avert spikes in bond yields, keeping the 10-year G-Sec yield low for now. But, this would also remove the incentive to deposit in banks, which in turn, would make bank loans costly. The returns to small savers on various schemes are through administered interest rates, which are clamped to the G-sec rate at the beginning of a particular quarter, with a spread above it. For the most common post office fixed deposits (medium-term), it ranges between 7 per cent and 7.8 per cent, for the current quarter. In comparison, one-year fixed deposit rate at State Bank of India at 6.4 per cent. “Small savings act as a competing asset class against bank deposits. When NSSF collections are buoyant, it effectively results in deposit flight from banks, compelling them to increase deposit rates. 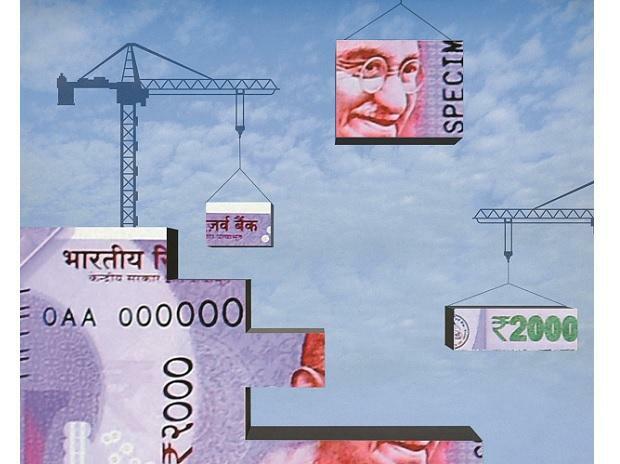 This in turn makes it difficult to reduce lending rates,” said Soumya Kanti Ghosh, group chief economic advisor at SBI. He said too much small savings is not good for commercial banks. Currently, while credit growth is at 14.5 per cent, deposits growth lags near 9 per cent in FY19, he said. Now, to ensure these returns, the NSSF is lending money to the government at a higher rate of 8.4 per cent this year, said sources in the government. But despite this, the government decided to borrow Rs 1.25 trillion from the NSSF, more than the original plan of Rs 75,000 crore. “There is no other way for the central government to use the NSSF funds, especially when states’ borrowing commitments from it are relaxed. It has to return money to small savers with the interest guaranteed,” said Devendra Pant, chief economist at India Ratings. Also, the reduced borrowing requirement from the market would have lesser impact on yields, and would keep them relatively stable, Ghosh said. Apart from helping with loans to fund the sovereign deficit, it would also supply fresh finance to public agencies across sectors such as food provisions for the poor, infrastructure like roads, railways and power. Post office savings deposit and recurring deposit accounts, and the senior citizen savings scheme account have shown the highest growth in the current financial year, official data show. PPF collection (net) on the other hand, has contracted 14 per cent.